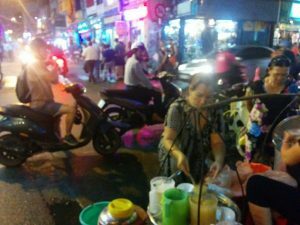 If you ask me what’s my favourite thing to do, or spot to visit, whilst in Saigon (Ho Chi Minh city) I’m going to point you to a somewhat obscure stall located in possibly one of the most tourist filled areas of the city (and for all the wrong reasons in my opinion) – Bui Vien, Pham Ngu Lao Ward, District 1. The other thing that I’ll tell you is that you’ll need to go at night, usually around 8pm is better. On occasion you might get lucky, just as I did tonight, when I arrived around 6.30pm and the familiar elder ladies selling possibly the best local dessert in the city were in their usual position – parked outside a shop with a banner that reads “Coffee 167“. Behind them is usually a bunch of their dessert-loving fans, seated on tiny red plastic stools, their faces brimming with joy from the sheer delightfulness of the silky sweet tofu dessert that these ladies are known for. So what’s this dessert then? a Chinese snack made with very soft tofu. It is also referred to as tofu pudding and soybean pudding. 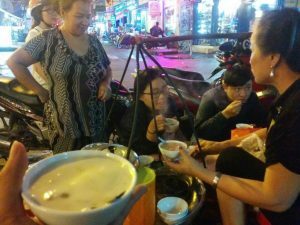 So this dessert is so popular that it’s also not uncommon to see a queue of people sitting on motorbikes waiting for their order, right in front of the ladies and their massive pot of liquid tofu delight. So how did I come to learn about this place? Well, my partner brought me here with her local Saigon-based friends on our last trip five months ago (which happened to be my first ever trip to Vietnam). It was through those locals that my partner first learnt about the tofu ladies. That was three years ago, she tells me. Do you see just how powerful word of mouth can be? 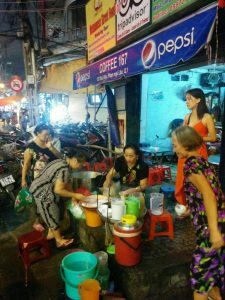 We also discovered that these ladies have been making and selling their particular brand of tofu dessert for over 30 years, 15 of those in this current location. So why am I raving on about this dessert? Because it’s hands down the best tofu dessert I’ve ever tasted anywhere. If you’ve ever been to yumcha in Sydney you’ll have most likely come across this dessert. The difference here is that the recipe includes some tapioca balls which adds a nice texture, and the mix of sugar water, ginger and tofu is truly unique. One guy loved it so much he had four servings whilst we were there, and he took another four servings takeaway! I was already full but, being that it was my last night in Vietnam, I ordered a second serving. It’s worth noting here that the ladies only prepare one huge put of their product and when it’s gone, and it doesn’t usually take them too long for that to happen, that’s it. Some poor soul will miss out, and we’ve seen it happen. Now your business won’t stick around for 30 years if your product is crap! When you’ve got a quality product people will spread the word for you. 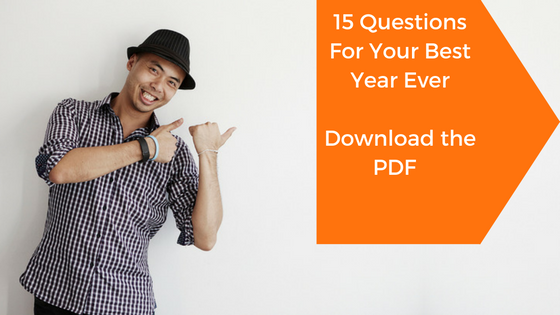 You’ll have loyal customers who keep coming back and they become your sales people. When you’ve got a winning recipe, don’t mess with it. Deliver tremendous value for the price people are paying. It still shocks me that one bowl of this tofu only costs 6,000 VND! Only offer a limited supply, and you’ll guarantee to sell out (assuming you’ve got a quality product). Choose a location that has high traffic of the right people for your business. I don’t know what this street was like 15 years ago, but nowadays it’s full of tourists every night. The interesting thing is that it’s not the foreigners who are buying this dessert, it’s the locals (which means they have a sustainable model as they’re not relying on a constantly changing client base). 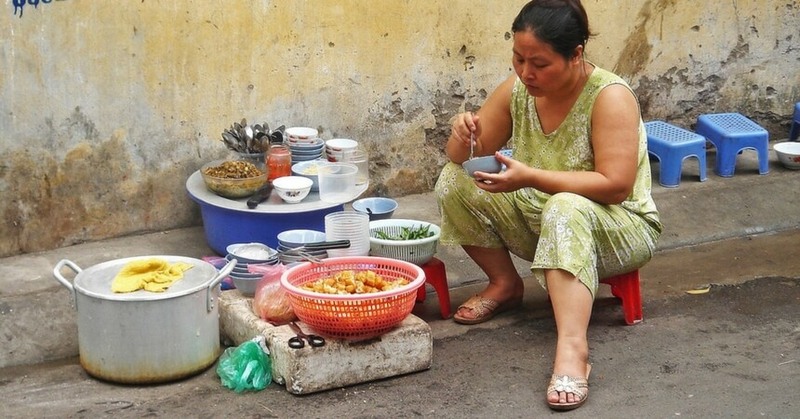 If you’re ever in Saigon I highly recommend you find these tofu ladies. Their dessert is simply amazing. So what do you take away from this post? Know any other cool spots in Vietnam worth visiting? Let me know in the comments below!